State-of-the-Art Technology Platform to Partner with leading Chinese healthcare solutions provider. SecondOpinionExpert, Inc. (http://www.secondopinionexpert.com) and Bodhi Health Group (http://www.bodhihosp.com) announced today that they have formed a strategic partnership to transform clinical practice and deliver enhanced patient care to improve health outcomes and significantly reduce costs for patients across China who wish to have access to U.S standard of healthcare. 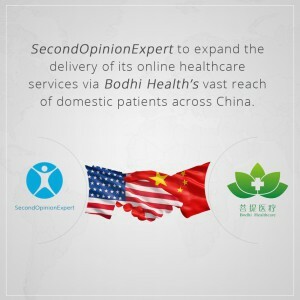 This partnership leverages SecondOpinionExpert’s cutting edge information technology and network of 250+ top US medical experts and the “Bodhi Health Cloud,” which provides healthcare solutions to hospitals, physicians and related healthcare parties across China. Bodhi Health Group, a privately owned comprehensive health system, utilizes leading hospital management concepts and an advanced health information system. The group established its foundation through investing and managing hospitals while heavily relying on contracted physicians as its core. Currently Bodhi Health System has signed contracts with more than 50,000 doctors in China. Bodhi Health is a subsidiary of Baheal Pharmaceutical Group, a major health care organization in China with annual revenue of over $600 million. “We are excited about this partnership enabling SecondOpinionExpert to expand the delivery of its online healthcare services via Bodhi Health’s vast reach of domestic patients across China. This is a powerful partnership that will reduce costs and save lives,” said Dr. Mohan Ananda, SecondOpinionExpert Chief Executive Officer. “Bodhi Health is enthusiastic about this strategic partnership which leverages the power of the SecondOpinionExpert technology platform and physicians to better serve our network of patients, doctors and hospitals,” said Ms. Qing Song, CEO of Bodhi Health. Additional information is available at http://www.secondopinionexpert.com and http://www.bodhihosp.com.